Traditionally, Enterprise Content Management (ECM) was confined to the back office, kept as an unstructured - albeit centralized - way to manage a myriad of content. However, over the past few years, ECM has seen a shift towards a more interactive role in the business. Paper is nearing extinction as digitization becomes the new normal. Machine learning, cloud technology, and mobile capability present new opportunities for the business, and there are new types of content - video, audio, social - that blur the lines of traditional ECM. The resulting shift has left many industry thought leaders wondering, is it time to rethink how we are defining ECM? In today's business landscape, there are multiple definitions of what ECM is and what role it plays, but here at Atlassian, Enterprise content management (ECM) is defined as the collaborative process of digitally managing and applying a company's information to support its processes and business goals - ensuring that information is easily accessible, and as useful as possible at any point throughout the content lifecycle. The right ECM system will help you automate processes, increase productivity, and encourage teams across your business to work better together. Content is everywhere. We’re creating documents, emails, spreadsheets, presentations and other materials faster and in greater volume than ever before. And it’s easy to see why. As more and more people around the globe work together, sharing information–accurate information–is critical. Such collaboration demands immediate, shared access to documents, files and other resources. Much of this content is in email, on your hard drive or in that file or–just somewhere. As this unstructured content grows, companies large and small are committing an increasing amount of resources to manage it. The idea behind an ECM platform is pretty simple: give everyone in the organization easy access to all of the information necessary to make decisions, complete projects, and work with maximum efficiency. Once it’s implemented, you’ll wonder why nobody ever thought of this before. ECM eliminates paper documents and the related filing systems. It takes your Everest-sized mountain of printed content––everything from invoices, resumes and contracts to correspondence and research reports––digitizes it, and stores it in a secure repository. And it helps keep your electronic files organized, enhancing collaboration and sharing. No more manila folders. No more paper cuts. More trees sighing with relief. But ECM isn’t just a cool, eco-friendly filing system. It’s a process that spans the lifecycle of content, from capturing information to publishing and archiving it. And then, after a given retention period, deleting those files. Because, hey, who wants a bunch of useless files hogging up space? Robust ECM systems tend to eliminate all that pesky downtime spent searching for stuff. They organize existing digital files in a central location, storing document metadata in folders. This makes content easily available to the right people at the right time. Users with access privileges can even perform full-text searches for specific documents. Regardless of device, they can then read, edit or print a copy whenever they need one, wherever they are. They can use the ECM system to look for words or phrases within the stored documents, too. In the beginning, organizations used ECM exclusively to reduce paper and streamline filing. But its role has become bigger––much bigger. A strong ECM solution reduces the time and costs associated with managing documents throughout their life cycles, ensuring compliance with record retention policies. If you handle questions from customers, ECM puts the answers right at your fingertips. It also automates manual tasks––things like photocopying, dragging and dropping, and hand delivery. It can increase security by restricting access to files and folders. And it can allow individual departments to control access; for example, keeping human resources information restricted to HR personnel. Today, even the acronym “ECM” has come to mean a diverse range of services. To understand more specific ways it could help your company, consider these three types of ECM. WCM puts control over the look and feel of a website in the hands of specific, key people. It’s used by organizations with relatively complex websites and strict brand guidelines, giving those key personnel the means to easily update, modify and publish content for the sites while adhering to the guidelines. CCM enables multiple people to access and modify a single document, such as a legal document. It’s ideal for organizations that must manage projects involving multiple stakeholders. CCM makes it easy to work together while keeping track of, and updating, the most-current version of the document. TCM is designed for organizations that repeatedly use varied types of content, including records, paper documents, and digital files. TCM solutions capture content from various channels, classify it, store it, create an automated workflow to ensure the right user receives the content at the right time, and even deletes documents when they’re no longer needed, all while working seamlessly with other apps and databases, ensuring all of that content is available throughout the company. Bring order to chaos. In today’s data-driven world, that’s critical. Across industries and service sectors, effective, enterprise-wide content management solutions are improving day-to-day processes while minimizing overhead. They’re playing a vital role in getting rid of content no one needs, including duplicate files and outdated information. On an even more practical level, they’re helping reduce the amount of storage and paper companies require, and how much mail they send. Whatever your organization’s mission, ECM is the key to eliminating the ad hoc processes that can expose you to regulatory compliance risks, lead to missed revenue opportunities, and drag down productivity. It’s an important tool for breaking through information bottlenecks, so you can communicate more clearly. Most important, ECM systems can be the first line of defense against the threats we face in our increasingly interconnected world. ECM forces organizations to manage and monitor content––all content––so that key personnel can more effectively respond to, and protect against, data breaches and financial fraud. Before you decide to implement ECM, understand the current state of your organization by asking yourself a few questions. Consider your short and long-term business goals. How will your ECM system help you meet those goals? How does your organization currently handle different types of content? If you already have an ECM solution, how does it function? Map out the business processes already in place. How does information move across the enterprise, among people, departments and systems? Are there departments or business units that have created their own content management solutions? In fact, this is the time to look at all of the people who move, touch, read, create and otherwise require access to content. All of the players matter, whether they’re internal users, customers, suppliers or partners. By documenting everything, you can get the clarity you need to create and manage a content management system that is secure, compliant with regulations and company guidelines, and that meets the needs of every part of the organization. Once you perform the due diligence, draw some conclusions on how content is created and where it is stored. Who has access? How do individuals and departments retrieve it? Who needs what when? From that analysis, you should have a pretty clear picture of the existing environment and should be able to categorize your data. Doing so can go a long way toward determining who needs access to certain information as well as what content needs to be saved and what can be deleted or thrown away. At that point, you should have a good idea of what type of ECM solution you need. And you can begin to choose the vendor and software to help you achieve your goals. By categorizing the data, and by understanding who needs it where and when, you’ll ensure your ECM platform addresses the needs of all concerned. This, of course, increases user adoption and helps smooth the implementation of the changes. When you implement an ECM solution, even with the help of a vendor, you’ll face some disruption in your usual work processes. Here’s a handy checklist to help you through a smooth implementation. Focus on the key areas first. Prioritize. At least initially, avoid getting sidetracked with issues that don’t need to be addressed or that don’t provide immediate value. Show everybody what you’ll get in return. Quantify the expected results, in financial and practice terms, for the organization. Invite buy-in. Get everybody onboard. That means everybody in every department that will be impacted––which usually means everybody. Talk about it. A lot. Share the vision, desired outcomes, and expectations you have for the new platform. And don’t forget to listen––provide plenty of opportunities for feedback. Decide what you need. Talk to your service provider. Your solution may mean you no longer need certain hardware or other infrastructure, including everything from laptops to smartphones, networks and cloud software. Own this. Create a single team dedicated to the implementation process. Get the members of that team up to speed on all of the details. Make sure they’re involved at every step. Make the rules. Choose who will have access to information and establish policies for its use. Include recommended lifecycles of data and procedures for how it should be discarded once it’s no longer needed. Test before you launch. When the new platform is ready, select a group of users to test it in a real-world environment. Then tweak, troubleshoot, or high-five accordingly. Stay loose. Any new technology or process needs a break-in period. So give it time. Allow the members of your organization to get familiar with it. And be willing to make adjustments. Schedule regular meetings to review input from all involved. More and more teams are blending social collaboration tools into the way they approach ECM, because it's not just about handling company information, it's about creating an integrated culture and corresponding platform where everyone is involved in how information is captured, stored and utilized. In their 2017 Magic Quadrant report, Gartner coined a new term to evaluate this area: Content Services Platform (CSP), describing it as an "an evolution of the Enterprise Content Management (ECM) Magic Quadrant." 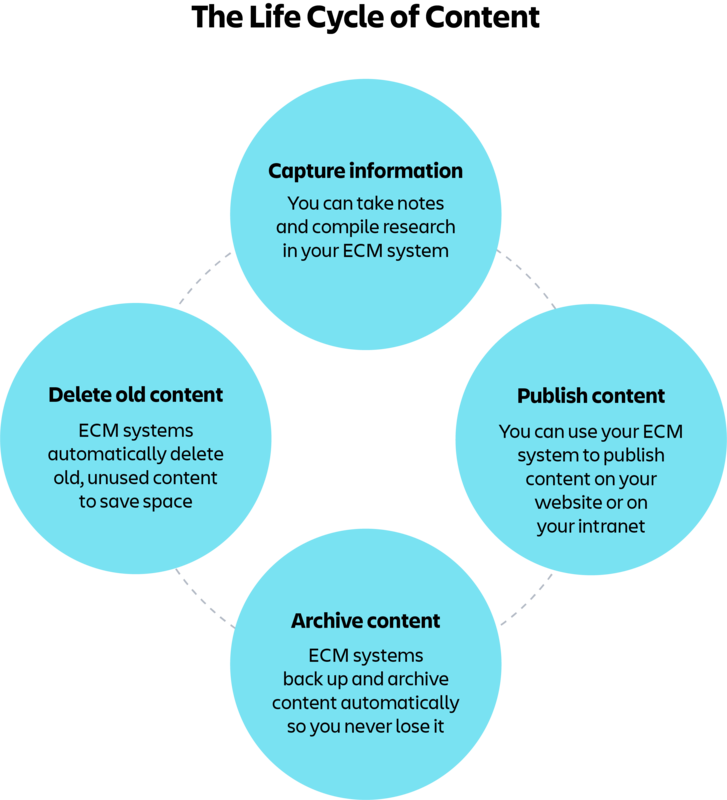 There are two things that immediately jump out of this "evolution," one being that ECM can not be limited to mere content management. It encompasses a greater range of responsibility including management, organization, searchability, application, and components. Second, it's becoming mandatory for teams to have a digital platform that provides infrastructure for what was once unstructured, a tool that has both functionality and flexibility and enables the content lifecycle to be more interactive. Streamlining ECM tools and processes within a unified platform for digitization will help teams meet deadlines, and more importantly, provide them opportunities to grow. What was once self-contained systems and repositories are now open services that are able to adapt continuously to meet the evolving needs of the customer. Social collaboration software has had a huge impact on the way teams integrate content and information into their day-to-day work, and the ability to get on the same page with your team, collaborate in real-time, and utilize a uniform navigation process makes even more of a difference on the effectiveness of your ECM software. An ECM solution should be able to provide the means to break down barriers with an open content platform that spans a range of applications, allowing teams to take advantage of the benefits of an interactive product suite. Advances in cloud, mobile, and analytics technology - as well as the continued integration of social collaboration tools - have expanded our expectations for what an ECM tool can do. The sheer volume of content that is being created and stored can be staggering, and over time, these technology improvements will drive the need for better usability and mobility among end-users. All of these signs point in the direction of cloud deployment as a primary means of maximizing ECM's effectiveness. Moving ECM to a cloud-based platform allows organizations to avoid up-front implementation and infrastructure costs, mitigate staffing expenses, and ultimately reduce their total cost of ownership on the storage and management of content. In addition to significant cost-reduction, organizations looking to improve their ECM's ease-of-use and accessibility will find that cloud deployment provides just that. Moving your ECM tool to the cloud makes it even easier for team members to store, retrieve, and apply content while on-the-go or working from home. While it feels like the topics of automation and machine learning have been forced into every conversation about improving work processes, they serve as natural counterparts for ECM. Considering the time and resources it takes to facilitate document capture, organization, storage, and continuous management, it's easy to understand why intelligent automation is having such a big impact on the way teams interact with information. It helps to eliminate rudimentary tasks, reduce processing time, and most importantly, provide the right information to the right people at the right time. Plus, the ability to ingest and classify metadata is becoming increasingly important to organizations. What would typically be a painstaking and time-consuming process can evolve an edge against competition. 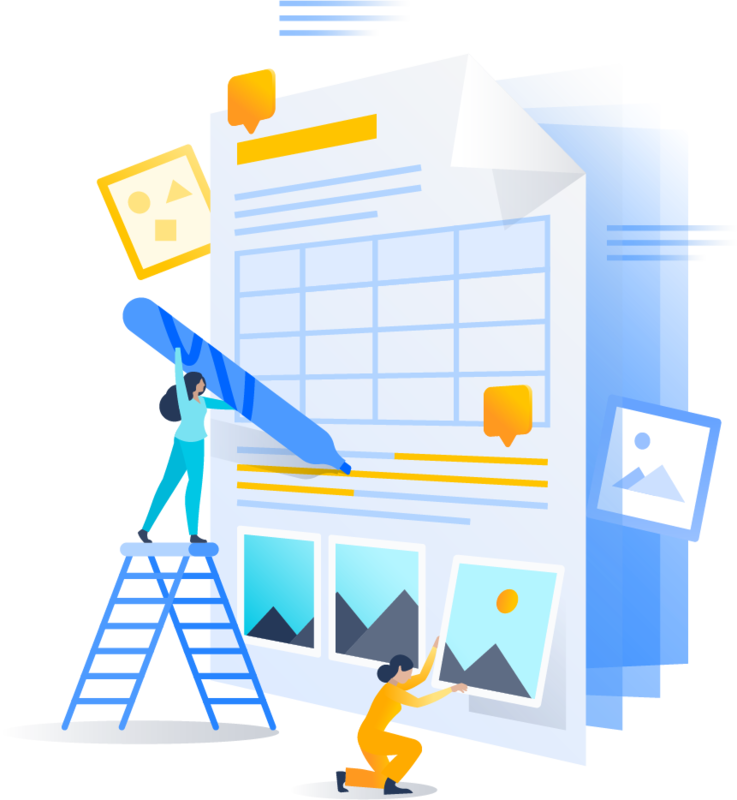 Discover how ECM can help your organization manage its content, boost efficiency and increase collaboration and productivity, by trying it free with Confluence ECM software.